Good insulation and air sealing are two crucial elements of energy-efficient homes that can help save you a great deal over time. By inhibiting thermal transfer, insulation helps reduce your household energy consumption and keeps your heating and cooling costs in check. Good air sealing has a similar effect. Air leaks are one of the most common causes of household energy inefficiencies, and sealing the cracks and gaps in your home is one of the most effective ways to control costs and reduce energy loss immediately. 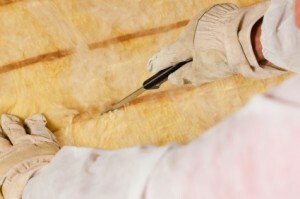 Energy-efficient home builders always follow best practices for installing insulation. Professionally installed insulation systems all have an air barrier, which prevents outside air from getting in and inside air from getting out. Any cavities in the framing must be completely sealed and the insulation must not be compressed or stretched in any way. Insulators will provide a vapour retarder, such as polyethylene sheeting, to stop moisture, but also allow for drying potential, where insulation can easily release any moisture it has absorbed. As a consumer, it’s a good idea for you to be familiar with the terminology and techniques used in case you ever decide to make changes or sell your home in the future. The ability of a given insulation product to resist the transfer of heat energy is measured by a metric known as “R-value.” The higher a certain product’s R-value, the more effective it is at inhibiting the exchange of heat. Note that insulation is equally important in winter and summer. During the cold weather, insulation helps prevent the heat in your home from escaping outdoors. During the summer, insulation assists in warding off the outside heat, keeping your home cooler and reducing your HVAC system’s overall load. Energy-efficient home builders ensure your home will be insulated with material of the appropriate R-value for the Alberta climate. Inability of an air conditioning system to cool things down. Traditionally, materials such as fibreglass, cellulose, and spray foam are used to insulate homes, but as environmental consciousness is becoming increasingly prevalent in the home building industry, many homeowners are looking for “greener” alternatives to such products. Materials such as sheep’s wool, mineral wool, cotton, aerogel, rigid polystyrene, and icynene spray-on foam are among the leading eco-friendly alternatives to traditional insulation. Energy-efficient home builders go to great lengths to eliminate air leaks to the greatest possible degree. In most homes, there are dozens of potential trouble spots, including the attic, piping shafts, soffits, exterior walls, crawlspaces, door frames, and window frames. These elements of your home must be carefully designed and painstakingly constructed to ensure that gaps and cracks that allow conditioned air to escape are carefully sealed, but still allow for controlled ventilation. Controlled ventilation is important to help you maintain better indoor air quality, and to keep humidity levels in the optimal range. Installing energy-efficient doors and windows is a great step towards a leak-free home. Energy-efficient home builders choose doors and windows with sturdy, airtight frames and specially designed glass panels to ensure that conditioned air won’t leak through. However, you should remember that a whole-house solution is needed to maximize energy efficiency, and that you have to optimize both air sealing and insulation to create the most energy-efficient indoor environment. You can’t sacrifice one at the expense of another. We at Fine Line Homes take great pride in being Alberta’s leading builder of custom, energy-efficient homes. If you are in the market for a new custom home and energy-efficient features are important to you, we invite you to discover the difference we can make. By employing proven design techniques, we help you dramatically reduce your home’s operating costs, potentially saving you tens of thousands of dollars over the course of your home ownership. We can also incorporate your choice of eco-friendly alternative building materials to further reduce your home’s environmental footprint. Energy-efficient homes also tend to have higher-than-average resale amounts since they offer extra value to potential buyers. If you would like to learn more about our design and construction techniques, or if you have any other questions about energy-efficient homes, please contact us at Fine Line Homes.